Analyst China Martens outlines a strategy for managing ERP application portfolios that blend SaaS and on-premises apps. Ask any firm to map out the applications it uses to run the business, and the result is a software jigsaw puzzle that blends overlapping pieces with both well-connected and poorly linked ones. Think of the puzzle as an ERP app ecosystem where the level of connectivity and relationships between different apps help to determine how effectively a firm can respond to changes occurring within its walls and outside in the markets it serves. The ecosystem may be dominated by the apps of a single ERP vendor or a mix of apps from a variety of vendors. Core financial management applications such as general ledger, accounts receivable and accounts payable tend to be at the root of any ERP app ecosystem because revenue generation is a firm's primary function and ERP's traditional focus is on transaction processing (see the figure). The core accounting apps are surrounded by a wide variety of other apps, which form part of end-to-end business processes such as purchase-to-pay. Core financial management applications form the base of ERP ecosystems, which contain a variety of other apps that handle parts of end-to-end business processes. Connecting technologies, such as integration and business intelligence, work across apps. The ERP app ecosystems of many organizations have mushroomed over time to accommodate their changing business needs, resulting in a large portfolio of apps that is both costly and time-consuming to manage. Individual apps have often been slotted into the ecosystem to fill areas of functionality that are too rudimentary, too generalized or just plain missing from a firm's ERP suite of choice. At the same time, within the ERP app ecosystem, there is substantial duplication and redundancy of app functionality, and firms continue to pay license fees for software they no longer use or have yet to implement. In these types of ecosystems, some apps are not on "speaking terms" with each other, i.e., they have little or no integration or two-way data exchange between them. Re-evaluating an ERP application ecosystem makes particular sense now, as the rise in availability of Software as a Service (SaaS) ERP apps coincides with companies' need to open up the data in ERP to a wider set of users and applications to speed decision making. 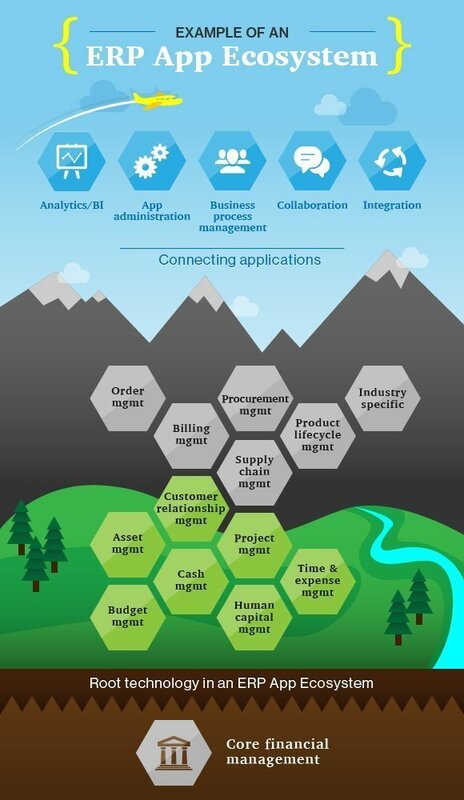 The potential benefits in starting to reshape an ERP app ecosystem around SaaS are numerous. They include infrastructure cost savings, speeding up existing ERP business processes by re-architecting them, and having access to the development platform the SaaS applications were built on so firms and partners can more easily customize them. There's also the promise of easier app integration and harmonizing user experiences when different ERP applications are based on the same Platform as a Service, or PaaS, thereby reducing training costs and the time needed to go live with new software. However, there's also the potential danger that firms will end up recreating their previous app-management nightmare in the SaaS world, which has been the experience of some SaaS early adopters. Today's SaaS ERP app market is changing rapidly, thanks to vendor expansion and consolidation. Many ERP vendors got their feet wet with SaaS applications aimed at small to medium-sized businesses. They're now scaling those apps up and adding more sophisticated global functionality; for example, SAP's enterprise-focused Cloud for Financials, which began life as the financials component of its midmarket SaaS ERP suite, Business ByDesign. Vendors are also expanding the scope of their ERP applications by building out or buying additional horizontal functionality -- an example is NetSuite's purchase of social HR vendor TribeHR -- or extra niche functionality, which includes Oracle's acquisition of SaaS configuration, pricing and quotation vendor BigMachines. Partnerships also become key as ERP vendors pick favorites from a specific category in the ERP app ecosystem -- for example, Workday's closeness with customer relationship management vendor Salesforce. Such partnerships indicate either an app market the ERP vendor has no intention of entering or a start to laying the groundwork for a future acquisition. The expectation is that ERP app vendors will use their emerging online app marketplaces to make such distinctions more concrete -- for instance, by providing the specifics that particular industries need to use generic apps and modules to handle, say, the order-to-cash process. In such a changing world, organizations need to closely monitor the moves being made by their core ERP app vendor. They should request clarity from vendors on their current and impending ERP app strategies, roadmaps, and ecosystems -- and timely updates on how those areas will be impacted by SaaS acquisitions. At the same time, decision makers need to be clear on the components of their own ERP app ecosystem. When considering investing in a niche SaaS application, they should require that assurances be written into their service-level agreements regarding what happens if the app's provider is acquired or goes out of business. Furthermore, with any SaaS investment that spans two or more application vendors, buyers must have a clear understanding of which partner shoulders the integration, uptime and support burdens and what responsibility the ERP vendor has, should one of its key SaaS partners be acquired by another player or go out of business. China Martens is an independent business applications analyst and freelance writer. Email her at chinamartens@gmail.com or follow her on Twitter at @chinamartens. TCO of SaaS: Is on-premise software a better deal over the long run?